Hi everyone and welcome! It's Nancy Dynes turn to host the latest challenge over at Frilly and Funkie and her chosen theme this time is 'You're My Inspiration!' Here's what she says about it; "Simply find any type of image or photo that inspires you to create a vintage or shabby chic project. Please post your inspiration image on your blog along with your project, and tell us what it is you love about it. The inspiration image does not need to be included as part of your project, just on your blog post." The team will choose their top four picks with the winner being invited to join us in a Guest DT spot at Frilly and Funkie and the next three will receive Top 3 badges to display on their blogs. Everyone who enters and follows the rules will be entered into the draw to have the chance to win a $25 spending spree at The Funkie Junkie Boutique, so there are plenty of reasons for joining in the fun. Time for the step by step tutorial, which has been broken into four chunks. 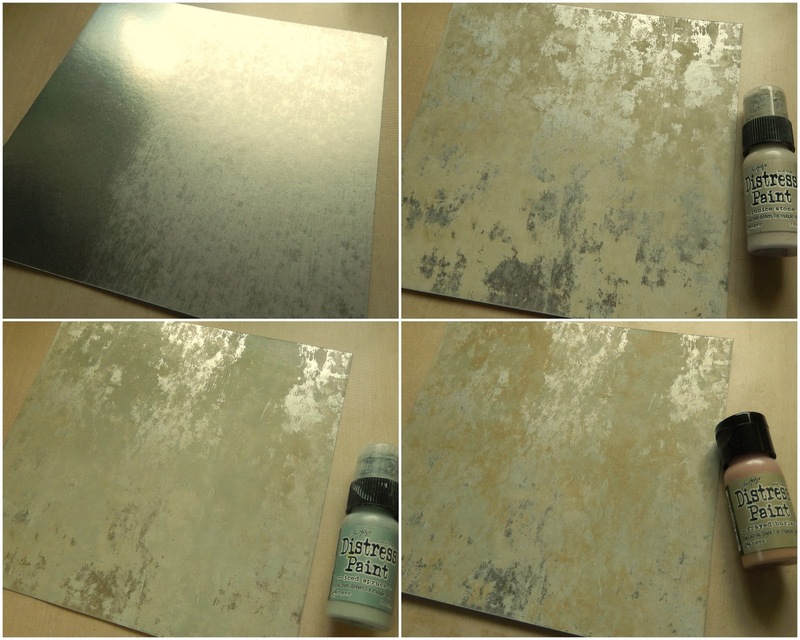 Step 1 - Rub over a sheet of Metallic Kraft card with a sanding grip. 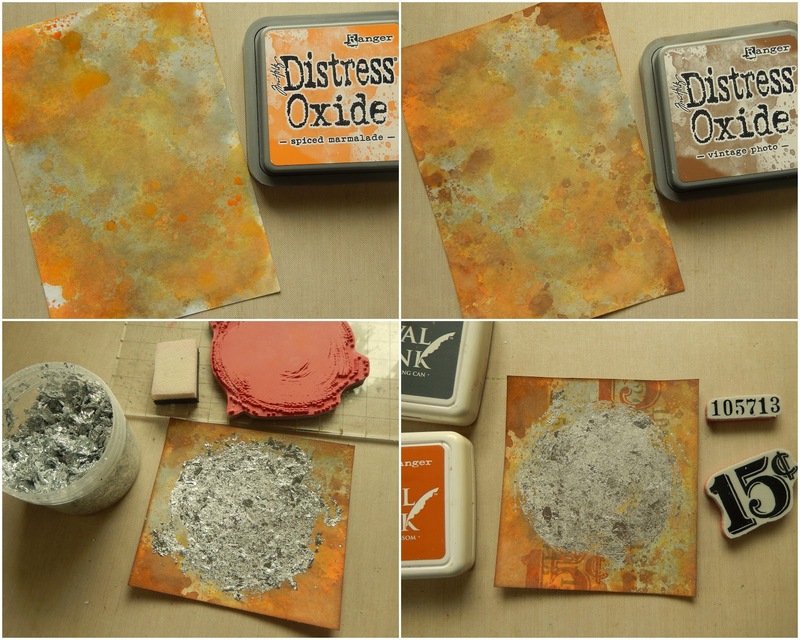 Step 2 - Use a brayer to apply a patchy layer of Pumice Stone Distress Paint. Step 3 - When dry, brayer a patchy layer of Iced Spruce Distress Paint. Step 4 - Repeat Step 3 using Frayed Burlap Distress Paint. Step 5 - Use the stamps from the Etcetera set with Black Archival Ink to add a patchwork of images over the card. Chop down the card to fit a 6" square card. 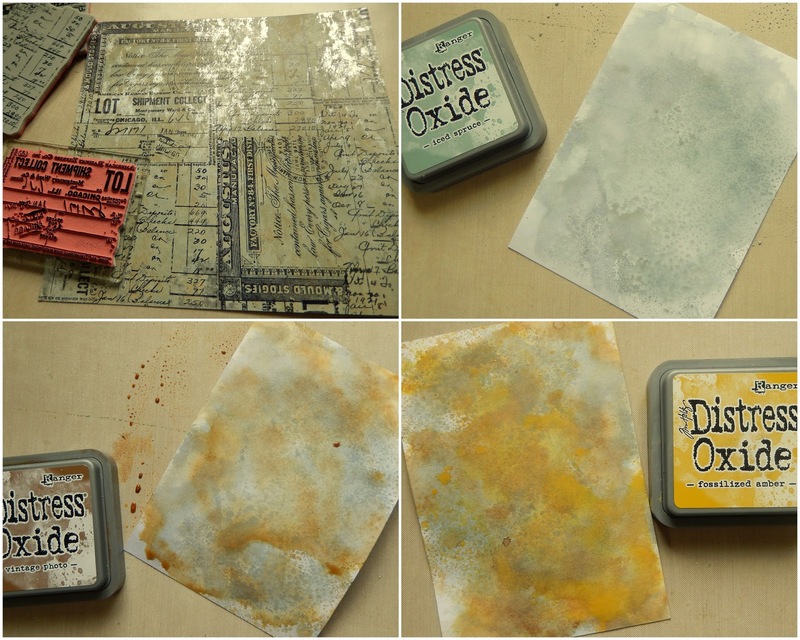 Step 6 - Take an A6 sized piece of card and dip it into diluted Iced Spruce Distress Oxide. Step 7 - Dry thoroughly before repeating Step 6 with Vintage Photo Distress Oxide. Step 8 - Repeat Step 6 this time with Fossilized Amber Distress Oxide. Step 9 - Repeat Step 6 with Spiced Marmalade Distress Oxide. Step 10 - Finally repeat Step 6 with another layer of Vintage Photo Distress Oxide. Step 11 - Cut a 9.5cm chunk from this card and use FlitterGlu to stamp the largest of the circles from the Brushstrokes set. Cover with Sheffield Steel Mega Flakes, rub over with your finger and use a Scoochy from the FlitterGlu starter set to remove any excess. Repeat this process using the ledger sheet image from the Etcetera set on the remaining inky card. Step 12 - Stamp the numbers in the Etcetera set at the top and bottom of the card using Orange Blossom and Watering Can Archival Ink. Step 13 - Use the circular die from the Tim Holtz Scribbles and Splats Thinlits die set to cut a spiral shape from the left over altered Metallic Kraft card. Stamp the two ephemera images from the Etcetera set onto card using Watering Can and Orange Blossom Archival Ink, then cut them out. Step 14 - Stitch around the edges of the main piece of Metallic Kraft card and the largest piece of inky card with a sewing machine and black cotton. Cut matting layers of Yellow and Black Classic Kraft card, sand and ink over with Vintage Photo Distress Oxide. Cut a rectangular piece from the ledger stamped inky card, then ink around the edges of both pieces with more Vintage Photo Distress Oxide. Step 15 - Add small splatters of diluted Ripe Persimmon, Worn Lipstick, Fossilized Amber, Tumbled Glass, Evergreen Bough and Weathered Wood Distress Paint over the centre of the larger piece of inky card (you can use less and your choice of colours instead). Step 16 - Add Rusty Hinge and Brushed Pewter Distress Paints to the edge of two Quote Chips. That's it for my DT project for the current Frilly and Funkie challenge 'You're My Inspiration!' I hope you've enjoyed today's tutorial. Do make sure you hop on over to see what my talented team mates have been inspired to create. And remember to link your own shabby chic or vintage projects, together with a picture showing what has inspired you to be in with a chance of winning one of the fabulous prizes. Oh my giddy aunt! This is magical, wonderful, inspiring and incredibly creative, Jenny! I am just so drawn to all the circular elements in the design. (That's exactly what my brain feels like when I'm hatching an idea, by the way.) The mirrored background is just so beautiful. Then all the amazing details with spatters and stitching and mica flakes and oooooh....just amazing. Thanks for the lovely step out, too! This is fantastic in so many ways... The design layers, the texture built into each of those layers, that fabulous silvery effect! Beautiful!! 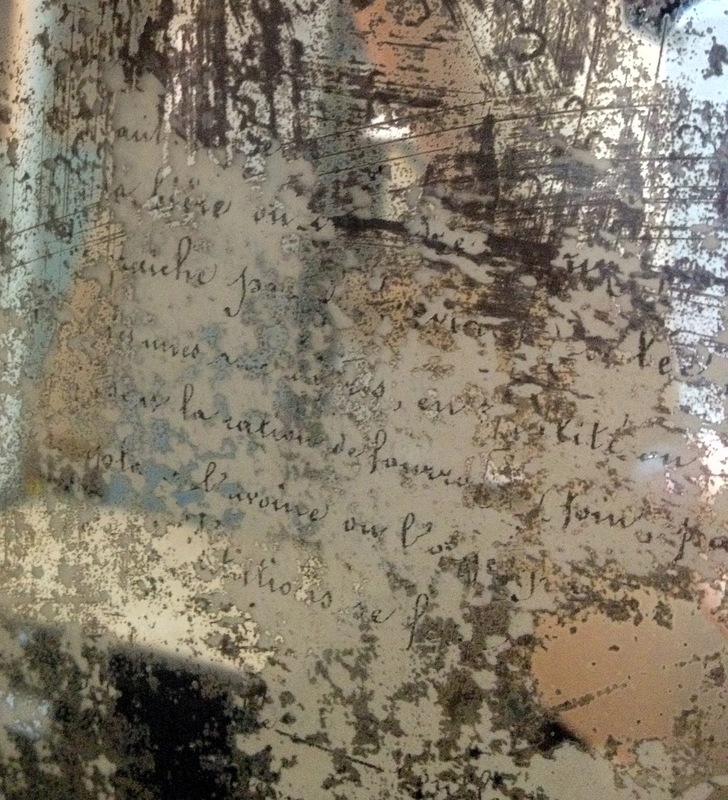 I love how you created your antique mirror effect! Oh, my goodness, Jenny! I wish I could hold this in my hands and turn it this way and that to see that mercury glass background (I love mercury glass!) and the flaked panel up close! Oh, every single one of your vintage layers are just amazing, and I want to case this so badly! The stitching, the circle die cut, the index clip--all the details on your card that work so perfectly together display the talent that exudes from you! You are such an amazing inspiration to me! Thank you for the very warm welcome to the team (I am still pinching myself) and for your very generous praise on my canvas! I appreciate these kind words even more coming from such a hugely talented artist! Hugs! Superb! Jenny in every way. An absolute winner- LOVE everything about it . WOW! Should be mirri ......so annoying when it is changed by spell checks !!!! Wow, wow, wow. I love your new take on your inspiration. The faux mercury glass effect is stunning. 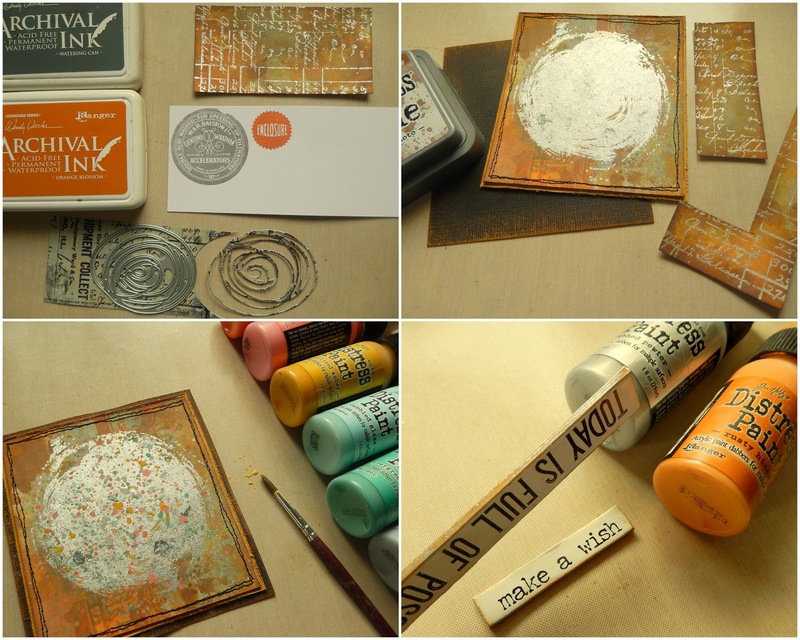 The various stamping is fabulous and the layers you created with different shapes work together so beautifully. Sara is right on - you and your creative talent are an inspiration. Jenny, love, love this! I have never seen this technique with the kraft silver paper and the silver flakes! Definitely going to try them! This is soooooooo good Jenny. I love every single thing about it. I love seeing the inspiration behind the art! Your card is fabulous, the layering and silvered effects look amazing! Just love it! oh wow. I first saw this fabulous piece on Facebook and my jaw dropped. Love this sooo much! This is the most amazing card I have ever seen! Thank you for sharing and thank you for showing your steps. That's an amazing piece of work, Jenny - from the swirl of the mercury-aged mirror (thank you gilding flakes!) to the fabulous layering and brilliant stitching detail - just magnificent! Ohhh myyy gosh!!! This is stunning! I didn't know that a vintage glass paper could be made. Thanks for including tutorials and I see where I am going to be spending my weekend..on your blog!! !